A group of flashmobbers took to the slopes in south-eastern Kazakhstan on a crisp March morning this year to spell out a heartfelt SOS with their bodies. In this case, SOS could have stood for “save our slopes:” the 70 activists who lay down in the snow to form the letters were protesting controversial plans to build a ski resort in an area of pristine natural beauty near the commercial capital, Almaty. Opponents were also calling attention to apparent conflicts of interest that surround the project and raise the potential for corruption. The dispute over plans to develop the pristine slopes of Kok-Zhaylau (“green summer pasture” in Kazakh) pits the city government and powerful business interests against environmental activists and concerned citizens, who are fighting to preserve a beauty spot inside the Ile-Alatau national park. Despite the official designation, development in protected territory is legally possible in certain cases. Supporters assert that the resort will attract tourists from as far afield as India and China, and with them a flood of investment and jobs. They say the project feeds into Kazakhstan’s strategy of promoting infrastructure projects and boosting the tourism sector to wean the economy off its current reliance on oil & gas exports. “In 30-40 years the oil will finish, and mountain tourism could become the engine of Kazakhstan’s economy,” Bakitzhan Zhulamanov, head of Almaty City Hall’s Tourism Directorate, a driving force behind the project, argued at public hearings in January. The plans – which Kuratov argues contravene national law and international environmental commitments – are not finalized, but are well-advanced. A feasibility study has been conducted by two companies, Canada’s Ecosign Mountain Resort Planners (an international leader in ski resort design) and the Kok-Zhaylau firm, founded and owned by Almaty City Hall. According to Ecosign’s website, if plans are approved, 77 ski slopes will be constructed stretching 63 kilometers, with 16 lifts capable of carrying 10,150 skiers at a time. In addition, hotels with a total of 5,736 beds will be built. The resort is “intelligently planned according to the state-of-the-art international planning and development standards,” Ecosign says. The goal is to attract a million visitors a year from within a four-hour flight radius of Almaty, spanning areas of India, China and Russia. Opponents argue this target is unrealistic. An influx would undoubtedly change the face of Kok-Zhaylau, whose unspoiled slopes are currently reached by most visitors via a steep three-hour hike. 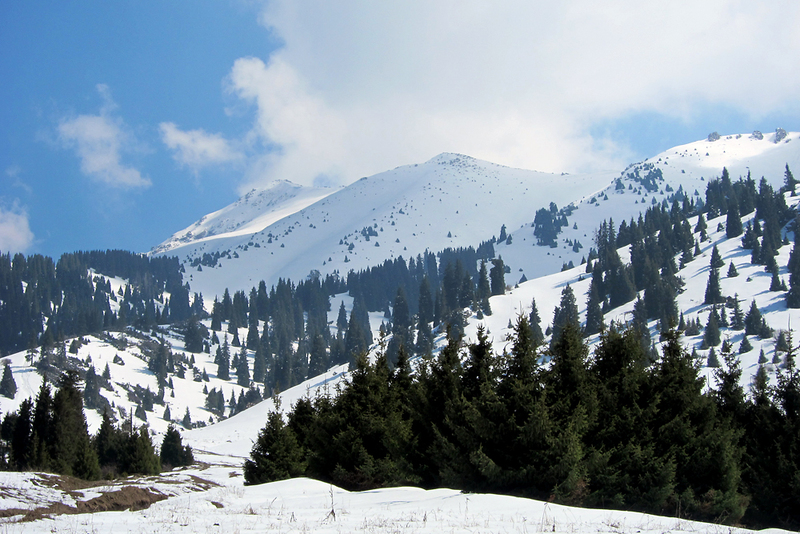 Many opponents say they have no objections to building a new ski resort near Almaty (which already boasts several, including a popular spot at Shymbulak), but not inside a national park. “We’re not trying to get rid of the plans for developing a ski resort, for developing the mountains, because […] we would also love our country to develop, but our position is that we call for all kinds of ski resorts to be placed out of the national park,” Nursultan Belkhojayev, a member of the Initiative Group of Kok-Zhaylau Protection (an unofficial body with no funding), told EurasiaNet.org. Developers “are going to change the habitat of the endemic species” in the park, added group member Zhamilya Zhukenova. This includes the endangered snow leopard – a symbol of both Kazakhstan and the city of Almaty. According to an open letter to President Nursultan Nazarbayev against the project signed by over 8,000 people, the area is home to 811 types of flora (including 17 listed as endangered by Kazakhstan) and 1,700 types of fauna. Zhulamanov has pledged that if research finds that the project will seriously damage the environment, it will be abandoned. He has promised to replant more trees than will be chopped down, and install webcams for real-time public monitoring of construction. City Hall also is dismissive of concerns about the potential for corruption and cost-overruns, saying that the close scrutiny to which the project is subject guarantees transparency. There is big money involved: as currently envisioned, the state will invest $700 million in infrastructure and seek $2.1 billion in private investment. Misgivings have also been voiced about potential conflicts of interest. According to a report published in the Alau monthly last September, Zhulamanov, the official propelling the project forward, is a long-time associate of Serzhan Zhumashev, the chairman of Capital Partners, which has built several major infrastructure projects around Almaty, including reconstructing the Shymbulak ski resort. Capital Partners managing director Aleksandr Guzhavin stepped down to head the new Kok-Zhaylau company founded by City Hall.